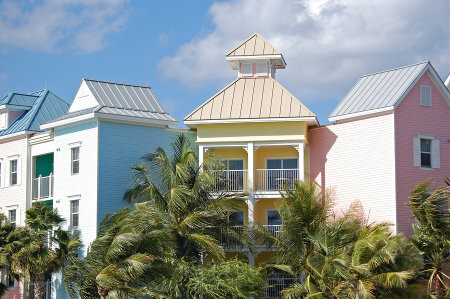 Search Paradise Island Condos for Sale in the Bahamas below! Paradise Island is the epitome of what most people consider the Bahamas: beautiful sunny weather, palm trees and a stunning aquamarine ocean. A beautiful small satellite island off the larger island of New Providence, its pristine sandy beaches and beautiful resorts and homes are established as a premier tropical getaway! The available luxury condominiums and exquisite resort-style homes are ideal for either a second home, an investment property or even year-round living. The infamous island community sees a steady stream sun-seekers as a popular cruise ship stopover. Plus, the capital city of the Bahamas, Nassau, is right across the bridge to the south. If you're looking for a relaxing beach community, check out the available Paradise Island condos for sale below, or, take a few moments to learn a bit more about this special island oasis. Paradise Island is renowned throughout the Bahamas, and indeed the Caribbean, for having some of the most luxurious properties in the world, available just steps from the beach. This includes an incredible array of sublime condominium complexes. Whether you'd prefer to live in the world famous Reef residences in the Atlantis Resort, or alongside the marinas and beaches of Ocean Club Estates, the choice is yours! Of course there are plenty of other supremely luxurious options awaiting you, start your search today. None of the responsibilities of a full, detached home. Convenient access to the Bahamas capital city of Nassau. Immediate access to the incredible beaches of Paradise Island. Interested in learning more about the available condos for sale in Paradise Island? Please contact ERA Dupuch Real Estate online, or call 242-393-1811 to consult a qualified Paradise Island real estate agent. ^ Return to: Paradise Island Condominiums.